Canada’s largest province, Québec, is a unique mix: North American and European cultures; English and French languages; vast wildernesses and vibrant cities; and an infectious passion for everything from outdoors adventure to gourmet food. In the east of the region, it offers both varied landscapes - from a jagged coastline to pastoral countryside - and rich cities such as Montréal and Québec City that ooze both sophistication and fun. The best places to stay in Québec allow you to experience all of these attractions. Sitting on the St Lawrence River, Québec City is the oldest settlement in North America and the province’s capital city. 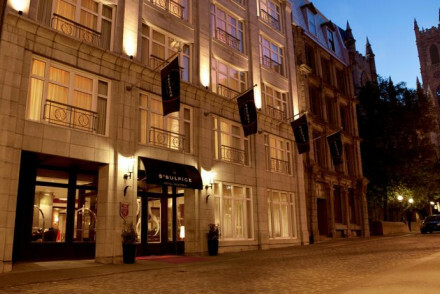 It retains its historic core (a UNESCO World Heritage site) around Place Royale, quaint narrow streets and old harbour. There’s also Notre Dame Basilica, the Parliament Building, Musée de la Civilisation - worth it for the architecture as well as the contents - cruises along the river, and the Montmorency Falls, a stunning waterfall between the Montmorency River and the St Lawrence River. Montréal is named after Mt. Royal, the spiky hill at its heart. 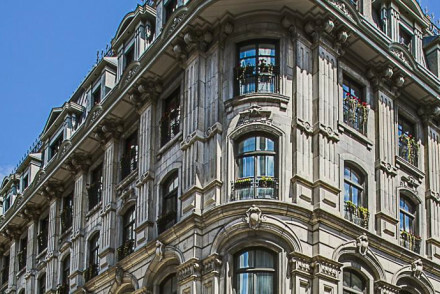 After you’ve taken in the cultural gems of the Musée des Beaux-Arts, Basilica Notre Dame and the Olympic stadium, treat yourself to French shopping - or window-shopping - along Rue St-Denis. Then head to the city’s Old Port, now a huge outdoor park along the St Lawrence River where everyone goes to stroll, cycle and in-line skate. Or take a cruise along the river or a trip in a speedboat. Of course, the province has a huge outdoor playground beyond its cities, from the jagged coasts of the Gaspé Peninsula and the bucolic Charlevoix countryside to the vast taiga and tundra of the North Shore. To the north of Québec city, Forêt Montmorency offers plenty of hiking opportunities and the chance to spot moose, wolves, bears, beavers, otters and birds. Parc de la Chute Montmorency has hiking trails, a via ferrata and thunderous waterfalls. The Parc National de la Jacques-Cartier is a mountainous plateau of forests and glacial valleys, attractive to cross-country skiers and canoeists as well as hikers and cyclists. Or try Parc National de la Gaspésie where moose and caribou can be spotted amongst the Appalachian peaks. In the south of the Province, North Hatley is the jewel in what is known as the Eastern Townships region - a lakeside beauty that's been a haven for holiday makers since the 1880s. The Magdalen Islands are a little archipelago in the Gulf of St Lawrence, well worth a visit for some off the beaten track beach and wildlife, plus awesome views. And don’t forget to take a whale-watching trip at Baie St Catherine where the St Lawrence River meets the Saguenay Fjord at the gateway to the vast Saguenay–St Lawrence Marine Park. The best time to whale-watch is between May and October when the best places to stay in Québec are likely to be popular, so do book ahead. In the heart of Quebec’s ‘Vieux Port’, Le St Pierre mixes the original features of the 19th-century building - exposed-brick walls, wooden floors - with pale-painted furniture and contemporary lighting. The luxurious Le Clos St Louis oozes romantic charm from its chandeliers and beamed dining-room to its antique furnishings, toile-du-jouy fabrics and four-poster beds. Full of French chic, including its menus. 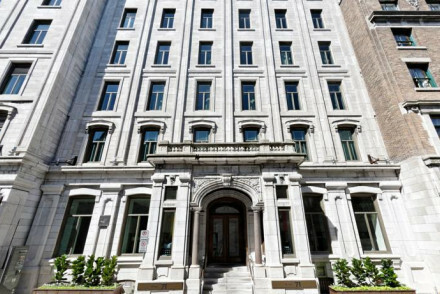 A contemporary boutique hotel in a grand, neoclassical building in the heart of historic Montreal, Hotel Gault offers sleek and modern rooms, some with small terraces. 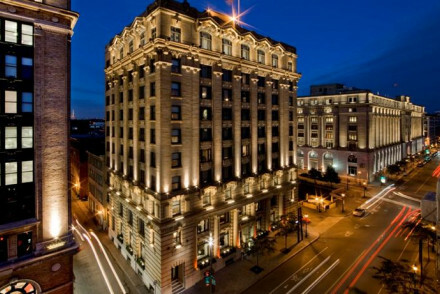 Also in the heart of ‘Vieux Montreal’, Hotel St Paul is another grand building with large, uncluttered, contemporary rooms that will suit both business and leisure guests. 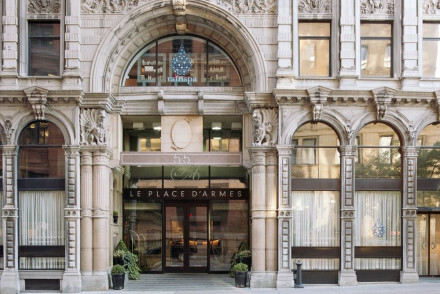 Opposite Notre-Dame Basilica, Le Place d’Armes Hotel & Suites is another lovely neo-classical building where rooms mix light, contemporary furnishings with wooden floors and exposed-brick walls. Enjoy city-views from its rooftop bar, Japanese food and a pampering spa. 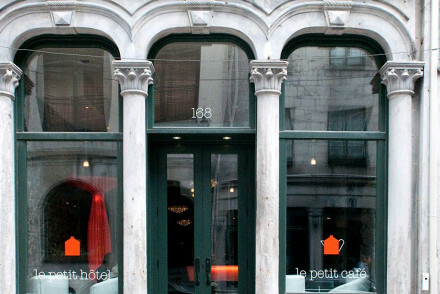 Le Petit Hotel is a trendy boutique hotel in the famed Old Montreal district. The decor perfectly marries past with present: rustic exposed brick walls with clean lines and contemporary art. The European style café serves artisan coffee and homemade snacks. A hip gem in this historic area. 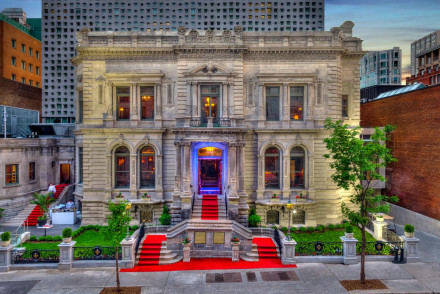 Well-located for exploring Montreal's sights, Le Saint Sulpice is a luxury hotel sitting just opposite the Notre-Dame Basilica of Montréal. The spacious and elegant suites come with a range of exceptional bonuses such as nespresso machines, kitchens and sit out terraces. The glass walled restaurant is sophisticated and full of light. A grownup city escape! 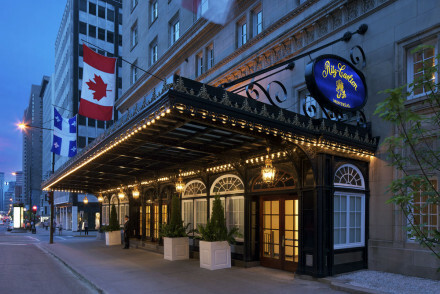 Ritz Carlton Montreal is a five star hotel in downtown Montreal. The opulent suites are all you would expect of the Ritz, think chandeliers, hardwood floors, plush rugs and sumptuous linens. Relax and recharge in the champagne bar, or take a dip in the heated saltwater pool. Stylish, extravagant and worth every penny! Complete with a lively bar, Hotel William Gray is a renovated period house offering luxurious contemporary accommodation in Montreal's historic Old Town. Interiors are a sophisticated blend of modern design meets historic architecture. There's a popular, buzzy bar and various dining options, plus roof top terraces for epic city views. 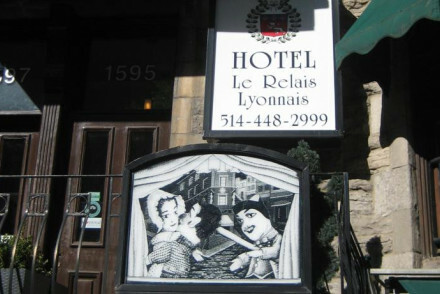 Le Relais Lyonnais is a 4* hotel set in the Latin Quarter in an 130 year old building that's been painstakingly brought into the 21st century. 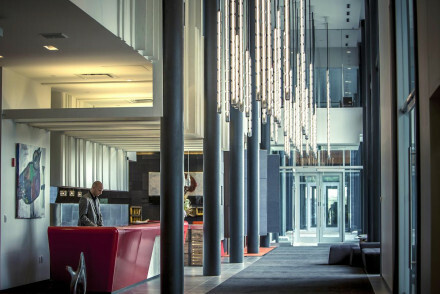 Merging old Montreal charm and modernity the light airy rooms offer crisp linen and suave leather seating. La Brioche Lyonnaise serves up an extensive french menu. 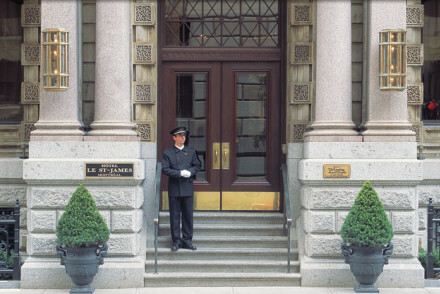 Also great for foodies, Hotel Le St James is a historic hotel on the famed St-Jacques Street, in the heart of Old Montreal. The perfect marriage of vintage chic and modern style. Think antique fourposters and chandeliers, while the trendy restaurant serves cutting edge cuisine. The best of both worlds. 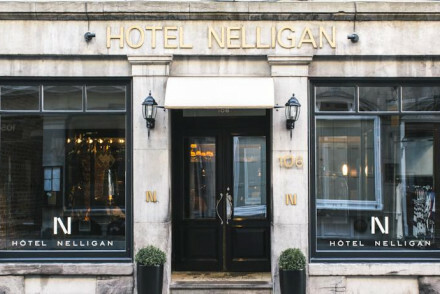 Hotel Nelligan is set in a 1850 historical building paying tribute to Quebec's poet Émile Nelligan. Contemporary and classic in style with exposed red brick, leather upholstery and wooden detailing make up the spacious rooms. 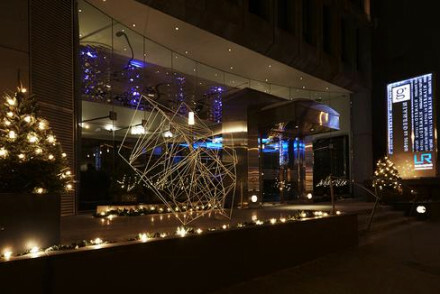 Verses Restaurant offers contemporary dishes al fresco or inside, either way always with fine wines. 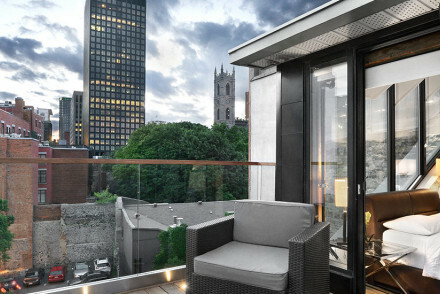 Providing excellent views of Montreal, Hotel Chez Swann is a boutique with unique use of art, light, sensual textures and materials. Vibrancy runs through the contemporary rooms and designer bathrooms. Restaurants are all around so delve into a world of different cuisines. Explore the city with the ease of a metro ride or on foot. If you're looking for a chic, central property then consider Hotel Epik - a boutique 9 room hotel with modern decor in the heart of Old Montreal. All exposed stone walls against slick stainless steel and leather furniture. Bag the penthouse for the ultimate in open plan living. Sample the chef's tapas whilst enjoying the view of Notre Dame Basilica on the roof terrace. 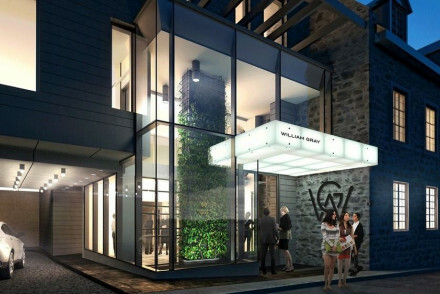 Hotel 71 is a chic hotel just outside the walls of Vieux-Québec. The ornate neoclassical facade is married with a contemporary interior decor. Suites feature large windows, free standing tubs and exposed brick walls. 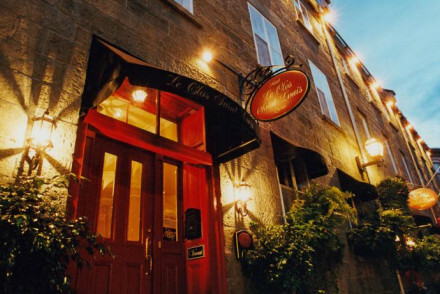 Explore Old Quebec like a local from this hip spot. On the shores of Lac Massawippi, Manoir Hovey is a lovely retreat whether you want to take advantage of the kayaking, fishing and walking or relax on the terrace or by the pool with a good book. Rooms are modern country-house and there’s a gourmet restaurant. With wide views over grasslands and forested hills, Hotel Le Germain is a sharply modern hotel with crisp, Scandi-style rooms. The hotel includes a spa, pool, gym and hot tubs as well as two on-trend restaurants. Also great for skiers, Hotel Quintessence is an upscale spa resort on the banks of Lac Tremblant. The plush rooms are understated rustic chic with fireplaces, wooden beams, heated marble bathrooms and luxurious tubs. Enjoy the spa, infinity pool and expansive landscaped gardens. A peaceful haven in the Laurentian Mountains. 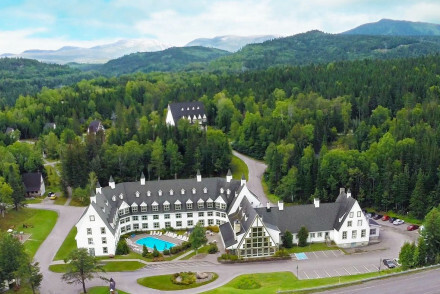 Great for outdoor pursuits, Domaine du Vieux Couvent offers eleven quiet and comfortable rooms overlooking the blue-green waters of the Gulf of St. Lawrence. The beautifully restored convent boasts a sun terrace and bike rentals. The on site restaurant, La Moulière is a gourmet affair headed by chef Denis J. Landry. Très bon! 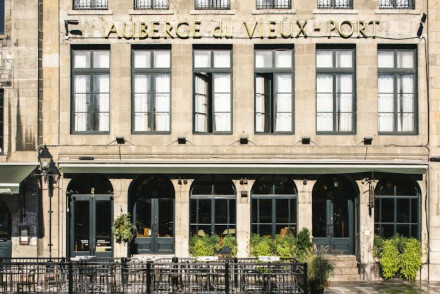 The lively, Auberge du Vieux Port is in a great location with river views, loft-like rooms with warm exposed brick, iron frame beds and modern bathrooms. A comfortable city-escape. Taverne Gaspar is casual pub food with fine Bourbons to match, or head for the hotel's rooftop bar and admire the fabulous views of the old city skyline. For a truly unique experience, visit Hotel de Glace, a winter fantasy land open from January to March end. 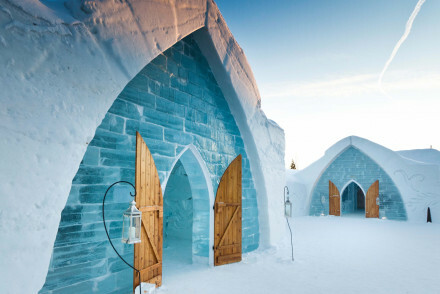 Spend a night under the ice in intricately carved rooms. Mood lighting lends a romantic air and wood burning stoves provide warmth. An in-house spa aids total relaxation, and the winter playground some serious fun. A unique experience. If you'd prefer a self-catering option this holiday - don't hesitate to visit our online partner, Booking.com for a diverse selection of properties to suit properties of all types. Fly to Montréal–Pierre Elliott Trudeau International Airport - Quebec's largest airport, located 18.5km (11.5 miles) from Montreal with a wide selection of flights across North America and Internationally to Europe amongst other destinations. Alternatively, catch a train with rail links across Canada including daily trains to Toronto and Ottawa. If you want to rent a car to explore the region, click here for prices and booking with our online partner, Rental Cars. Best time to visit - the summer from June to September for pleasant weather, ideal for city exploring or enjoying outdoor pursuits. A quiet B&B set in a picturesque rural spot just outside Quebec. Rooms are bright and spacious yet they have a warm country feel; think parquet flooring, crisp white linen and sink-into beds. The breakfasts are indulgent and locality perfect for getting the best of both worlds; city and country. Located in the stunning Gaspésie National Park, offering hiking opportunities in the Chic-Chocs and McGerrigle Mountains. Offering fine cuisine and an outdoor heated pool. Well placed for skiing (ski-rental and passes are sold at the hotel). A comfortable retreat to return to after a day outdoors. 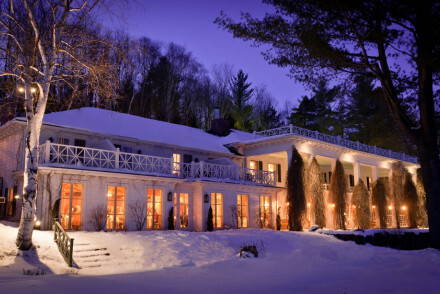 A charming turn of the century inn sitting in 35 acres of manicured grounds, on the shores of Lac Massawippi. The elegant and crisp suites have been lovingly decorated with individual features. A stunning and sophisticated hideaway. Hideaway - With a whole host of on-site activities and restaurants there is no need to step off the grounds! Fishing - The hotel offers facilities for fishing on the lake. Kayaking - The hotel offers seasonal kayaking on the lake. Set in a large historic townhouse in the downtown area, minutes from attractions, bars and restaurants. With a well equipped gym and fully serviced spa offering massages and treatments, this is popular for those seeking relaxing city breaks. The gourmet restaurant also offers culinary delights. 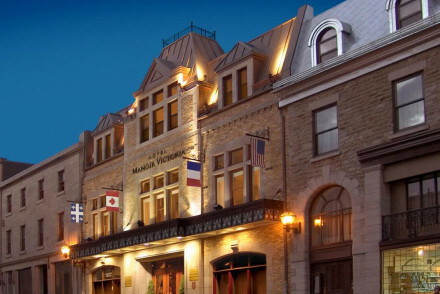 A trendy 19th century hotel in the heart of Quebec's Old Port. The chic suites feature exposed brick walls, hard wood floors, pretty painted furniture and stylish art pieces. After a long day's exploring, unwind beside a roaring fire in the plush library. Urban and elegant. Great walks - Just 12 KMs from Old Port find Montmorency Falls, surrounded by lovely parks ideal for walking. Local markets - Spend an afternoon exploring the multitude of antique shops on St-Paul Street. Sights nearby - Nearby sights include Notre-Dame de Quebec church and La Citadelle de Quebec. 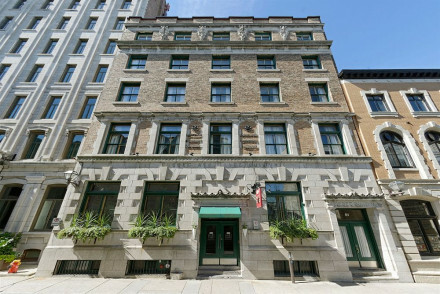 Historic hotel located in the heart of the city within walking distance of Galerie D’Art du Chateau Frontenac. 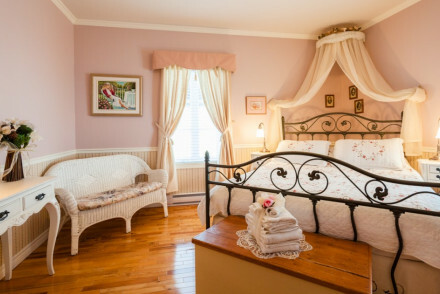 All rooms offer elegant decor with four-poster beds, romantic prints and lots of antiques. Plenty of French chic from the bedrooms right through to the menu. Great for a couples break. Romantic Break - Period decor, whimsical wallpapers, four poster beds and fine dining make this a great spot for holidaying couples. 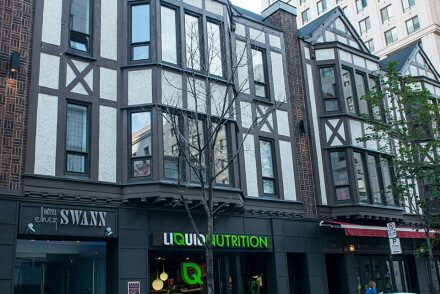 Local exploring - Centrally located in Old Quebec, within walking distance of the main historic sights and attractions. Sights nearby - Just a five minute walk to the magnificently ornate castle of Le Château Frontenac. Great walks - The Ghost Tours are a good way to see the city and learn a little history. 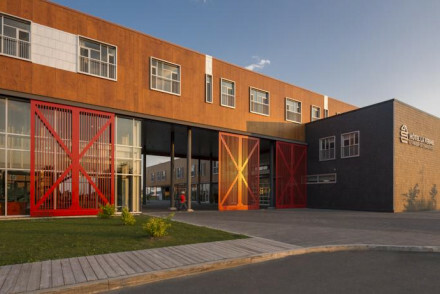 A contemporary chic hotel in the heart of Baie-Saint-Paul. The ultra trendy rooms feature wooden floors, clean lines and plenty of natural night. There is no need to stray far for entertainment as the property complex includes an art gallery, spa and two hip restaurants. Sights nearby - The on-site Massif de Charlevoix train station allows guests to explore Charlevoix’s scenery and gastronomy. 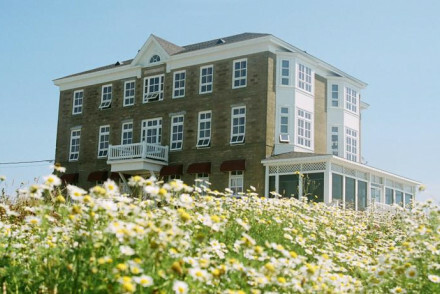 A distinctive and remarkable hotel, set on a working farm in the heart of Baie-Saint-Paul. The sleek and carefully designed modern rooms offer spectacular views. A range of restaurants all serve produce directly from the land, fresh full flavours are key. A real show stopper! 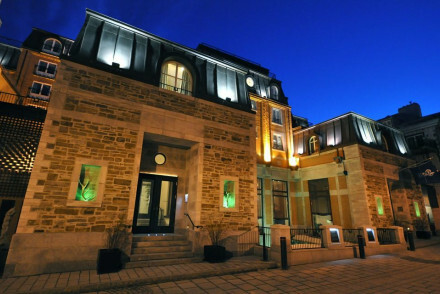 A beautifully restored boutique hotel in Quebec City's Old-Port area. The decor is rustic chic with sumptuous linens, modern fixtures and luxurious tubs contrasting with exposed brick walls and wooden beams. The on-site upmarket restaurant, bar and spa will leave you feeling totally spoilt! Great walks - The Plains of Abraham are perfect for walking in summer and cross country skiing in the winter months. Sights nearby - Sainte-Anne-de-Beaupré Shrine and Place Royale are both worth a visit! Domaine du Vieux Couvent offers eleven quiet and comfortable rooms overlooking the blue-green waters of the Gulf of St. Lawrence. The beautifully restored convent boasts a sun terrace and bike rentals. 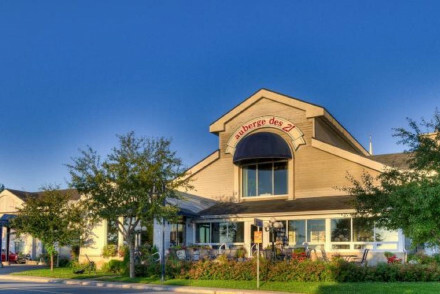 The on site restaurant, La Moulière is a gourmet affair headed by chef Denis J. Landry. Très bon! Foodies - Home to the gourmet bistro La Moulière foodies will feel right at home amongst the freshly caught mussels, clams, and lobster. Back to Nature - Whether it's hiking, biking, beach combing or kayaking there are plenty of outdoorsie pursuits for the nature loving guest. Birdwatching - Keep an eye out for local birds, this area teams with them in the summer months. Great walks - The beach provides the perfect spot for a long morning stroll. A chic hotel just outside the walls of Vieux-Québec. The ornate neoclassical facade is married with a contemporary interior decor. Suites feature large windows, free standing tubs and exposed brick walls. Explore Old Quebec like a local from this hip spot. Sights nearby - Place Royale de Québec, the oldest French American settlement, is a must see. It also houses the oldest stone church in America. Local markets - Visit Le Marché du Vieux-Port food market for fresh produce, artisan foods and fresh catch! Great walks - Take a guided walking tour of Old Quebec and learn the history of this ancient area. An upscale spa resort on the banks of Lac Tremblant. The plush rooms are understated rustic chic with fireplaces, wooden beams, heated marble bathrooms and luxurious tubs. Enjoy the spa, infinity pool and expansive landscaped gardens. A peaceful haven in the Laurentian Mountains. Skiing - Ski the highest peak in the Laurentians down one of the 96 marked ski runs! Great walks - Join a splendid guided snow-shoeing tour to reach Versant Soleil’s shelter where you will be treated to a hearty meal. A winter fantasy land open from January to March end. Spend a night under the ice in intricately carved rooms. Mood lighting lends a romantic air and wood burning stoves provide warmth. An in-house spa aids total relaxation, and the winter playground some serious fun. A unique experience. Hideaway - Hideaway beneath the ice in this fantastically unusual hotel. Great walks - Head off to explore on foot, or take a guided dog sledding tour.